The VCA/Mixer is one of the few modules that uses switching jacks, and thus needs special consideration when being converted to banana jacks. The only other modules that use switching jacks are the Triple EG (and only for chaining trigger inputs - easy to remove the normalled jacks and stack patch cables), and the Sample & Hold (which I've already taken care of with switches to go between the internal & an external source). On the VCA, switching jacks are used for both the signal and VC inputs. The switches are connected to ground, to provide 0V at those inputs when no jack is inserted. Obviously switches could be added to the panel, but that would overkill for something like a VCA (and a pain to use!). I'm actually not certain how critical these switching jacks are, but I figured I should try and implement it as best as possible. Although I've seen this method elsewhere, the first time I saw it was on Ken Stone's CGS Digital Noise schematic: there's a CV input where the jack is normalled to +15V. 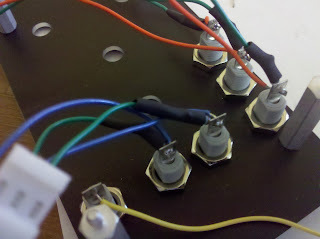 Clearly, this would pose a problem for banana jacks, but the solution was to put a 100k pull-up resistor between the jack and +15V, and then connect the jack directly to the input on the PCB. The theory is that when there's no input, the +15V flows through the resistor to the input. But when a signal is inserted, its impedance is lower than the 100k resistor, and overrides the +15V signal. I've seen it elsewhere since, but usually just for clock signals. Anyhow, I've done something similar here, with a pull-down resistor to 0V on these inputs.